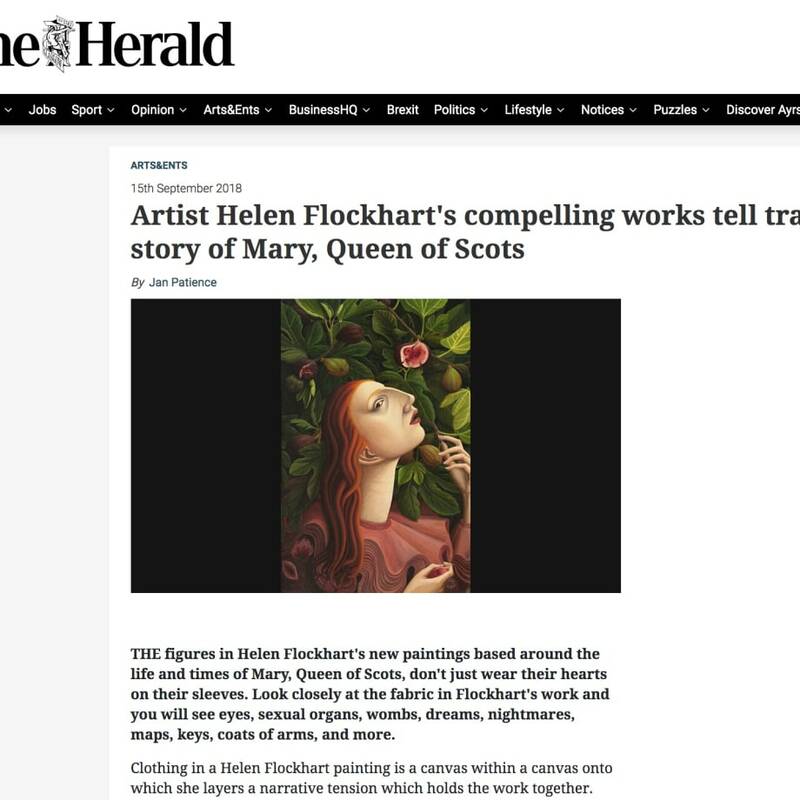 The figures in Helen Flockhart's new paintings based around the life and times of Mary, Queen of Scots, don't just wear their hearts on their sleeves. Look closely at the fabric in Flockhart's work and you will see eyes, sexual organs, wombs, dreams, nightmares, maps, keys, coats of arms, and more. Clothing in a Helen Flockhart painting is a canvas within a canvas onto which she layers a narrative tension which holds the work together. She has even been known to shoehorn the odd dig at uppity historians. On one painting, Lachrymose Window, you'll find a line from Dr David Starkey's back catalogue on the sleeve of Mary's gown. Starkey once called the doomed Scots Queen, “a whore and a trollop and a murderess”. So there you have it… in blue and white. Today, at Edinburgh's Arusha Gallery, the Glasgow School of Art-trained painter unveils a new series of 17 paintings under the banner of Linger Awhile. The title is taken from a section of Faust, the two-part play in which eighteenth century German dramatist, Goethe, tells the story of a man who sells his soul to the devil. The comparisons between Mary and Faust are writ large in the signature work, Linger Awhile, which depicts an innocent Mary with her equally callow first husband, the doomed Dauphin of France. When the show ends in Edinburgh next month, it will transfer to Linlithgow Burgh Halls, where it will remain until January next year. Flockhart has long been interested in Mary Stuart but this exhibition gave her the catalyst which allowed her to immerse herself in researching the doomed queen's life and death for the last 13 months. When I meet Flockhart in Glasgow specialist framers, Art Hire, the paint is barely dry on several of the works as the last ones are placed in frames. It's a chance for her to draw breath and see the paintings as a group before they head to the hubbub of Edinburgh. She paints slowly, she tells me, so this is a large body of work for her – and one which has been produced in a relatively compressed period of time. The devil is in the detail in a Helen Flockhart painting. She uses oil paint which is light in pigment but rich in oil in order to give her the flexibility to build up layers "like watercolours". Her backgrounds are richly textured with intricate patterns gleaned from the botanical world. Laced into this, you'll find potent symbols in the shape of fire, eyes, fruit and even whispers of barely-visible buried words. 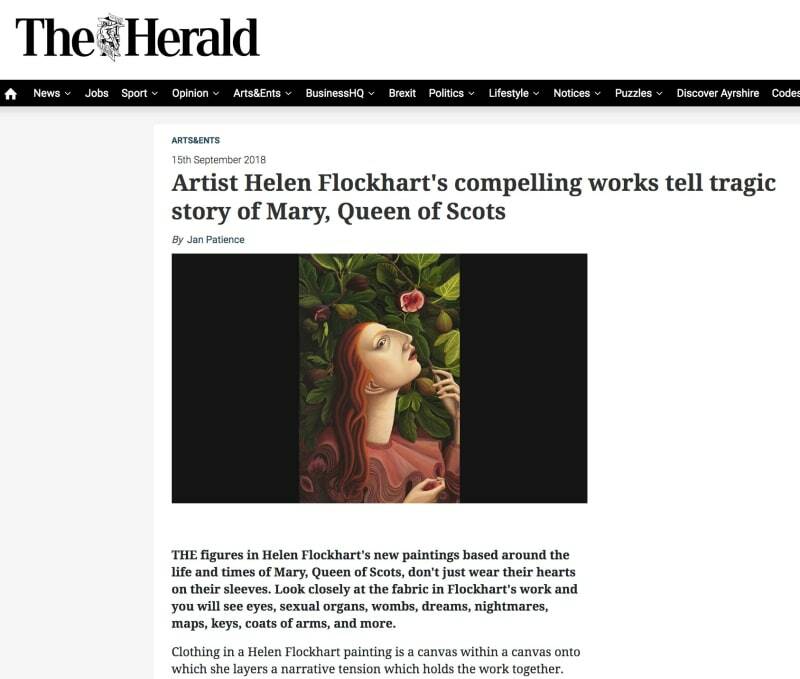 When she was first approached about exhibiting in the Arusha and Linlithgow, Flockhart tells me her interest was piqued at the thought of showing next door to Linlithgow Palace, birthplace of Mary, Queen of Scots. In the same way Flockhart, who has long red hair, always paints herself, it feels plausible to say that she has always painted a character not unlike Mary into her work. In all but one of the new paintings, the female protagonist is gazing steadfastly to the side. All the women are connected to Mary in some way; be it Mary of Guise (her mother), Elizabeth I (her cousin), or Philippa of Guelders (her great-grandmother). The exception to this sideways stare rule is found in a work called Red Bodice. This depicts Mary Stuart at the very end of her life. Still a young woman at 44, she has been stripped of her regal garments prior to being beheaded in front of an invited audience of noblemen at Fotheringhay Castle in England for her complicity in a plot to murder her cousin, Queen Elizabeth I. She had been a prisoner since she was 25 years old. "It was set up as a piece of theatre," Flockhart explains. "Apparently she was wearing outer garments of black and lace when she walked to the block but then she had to disrobe in front of everyone to add to her humiliation. Underneath, she was wearing a bright red bodice and petticoat." This starkly-beautiful painting provides a book-end to the suite of paintings, which begins with the large work, Linger Awhile, which gives the exhibition its title. This painting depicts Mary locked in an innocent embrace with her first husband, the Dauphin of France, Francis, whom she married when she was 15 and he was 14 in 1558. The pair, who were brought up together at the French court – with plans afoot to make Scotland part of France – lie engulfed in crumpled diaphanous bedding and lace from her petticoat. He looks like he could be her child. This tender scene evokes a sense of peace and comfort, while bright tumbled wild flowers recall the abandonment and carelessness of youth. Along the top, there's a small embroidered panel interlacing their initials. Flockhart starts her relationship with the young queen by wondering what Mary (like Faust, giving the devil his soul in exchange for worldly pleasures) would have given to remain in this idyllic stage of life during all the turbulent years which followed. Intricate patterns of Scottish thistle, French fleur de lys and Tudor rose form the lace of her dress, the symbolism of history providing a heavy portent for future events. The stars of the show are nine portrait-style "heads" so lush and rich in texture and detail as to send your synapsis into orbit. To say they are glowing is no understatement. In Lover’s Eye, inspired by Gerda Stevenson's poem The Abdication of Mary Queen of Scots, the motif on the dress is repeated like wallpaper pattern. Mary is shown escaping Loch Leven Castle, pushing a bark carrying two small figures – a reference to her miscarrying twins during her time at the castle. As well as using Mary’s dress as a medium for historical references, Flockhart weaves the legend of Mary into her own outfit. Lachrymose Window sees Mary’s blue and white embroidered dress heavy with stories, including the David Starkey slur. Queen Elizabeth is there, alongside a banner from the Scottish battle of Carberry Hill, John Knox as a crow and a dolphin to represent the Dauphin. An inflammatory poster produced after Mary's marriage to the Earl of Bothwell shows a hare and mermaid; the former a hint to his family’s coat of arms, the latter the symbol of a prostitute. Mary sits patiently by a window covered in thick fern and ivy, a nod to the 19 years she spent incarcerated by her English cousin. I often hear other artists speak of Helen Flockhart's work in reverential terms. She may not be one Scotland's best known artists but she should be and it's possibly only native reserve which has held her back in this regard. She is the least shouty artist you'll meet on a day's march but her work speaks for itself in the most eloquent and elegant fashion. Linger awhile with it. You won't regret it. If I was a curator working with a national collection, I'd be snapping up one of these jewel-like paintings posthaste.